The new Notes app in OS X features a default font that is kind of hard to read and looks a bit goofy, nearly like Comic Sans. If you want a more professional looking font that’s easier on the eyes, you can easily switch the default font from “Noteworthy” to the always classic Helvetica, or another font of your choice. You can change it in the iOS Notes app too. 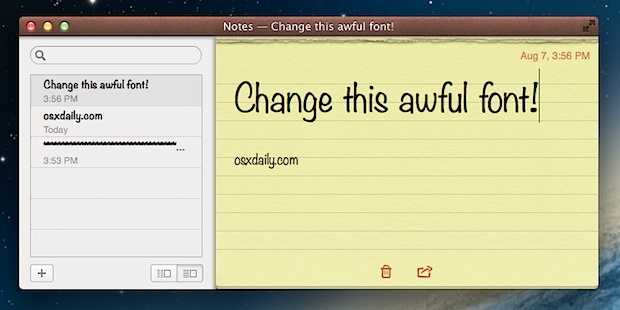 This works in all versions of OS X that have the new fancy Notes app, whether you’re using OS X Yosemite, Mavericks, Mountain Lion, you can switch that font in Notes app. Also: remove Markerfelt and Noteworthy from your system fonts folders and you’re done. You can use other fonts or font sizes (or add fonts to the menu) by editing /Applications/Notes.app/Contents/Resources/en.lproj/DefaultFonts.plist, or the corresponding files for other languages. It doesn’t break the code signature, because the lproj folders are omitted in the CodeResources file. I don’t understand where is the difficulty to do this? It doesn’t change the default font, which is used by new notes and notes without formatting. Hello! today i found an hidden trick in notification center, in right corner theres notification center icon. click it when holding option (ALT), it will turn off! Off-topic, but useful nevertheless so thanks! I know this is a bit off topic, but how can we now sync Notes with i.e. iPod Touch?… Before Mountain Lion, I was able to sync via iTunes, now this cannot be done! I know it can be used via iCloud, but I just want to sync the way it was before. I hope Apple gives us the option without iCloud sync!